If that is "THE" John Larson who built the "Pursang", which later became the "Airdale" - THE one who did the "Engine Beat" for Kitplanes or Sport Planes Experimental magazine - you are in great hands.....Good fellow flyer and good to talk to and get advise from. Welcome Mark, great to see you log in! I must say, I watched that listing with interest. I think you got yourself something more like a 'Super' Avid+. I see features from Larsen's Pursang and the Airdale Flyer; features that the typical Avid+ or Fat Avid upgrade does not have. Ie., really like the foot well and faired main gear, and it wouldn't surprise me if it has the higher gross Airdale Flyer wings too. I also noticed the teleflex cables from the mixer to the flaperon horns are routed differently. Looking forward to seeing more of it when you get it home. First off welcome to the forum! I know Paul personally and you found a great deal. I tossed around the idea of snatching it up myself as he offered it to a few people before it went online. I think you will really enjoy it and it's in a perfect spot where you can still do most of the things the way you want them such as the panel, wiring, ect. 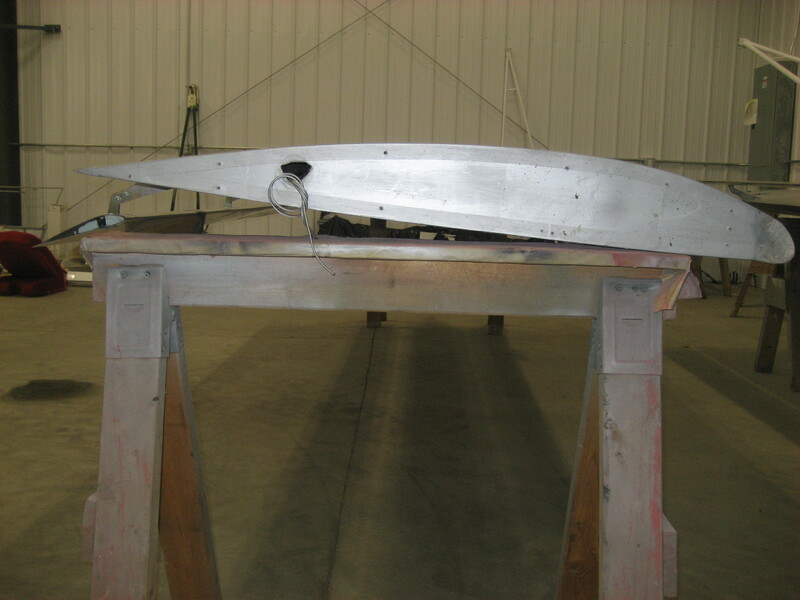 The speedwing spars for the Avid are 108" and a 36" extension was the usual. Not to pic a nic, but spar length is actually 108-1/2"
length, lift strut o.d. 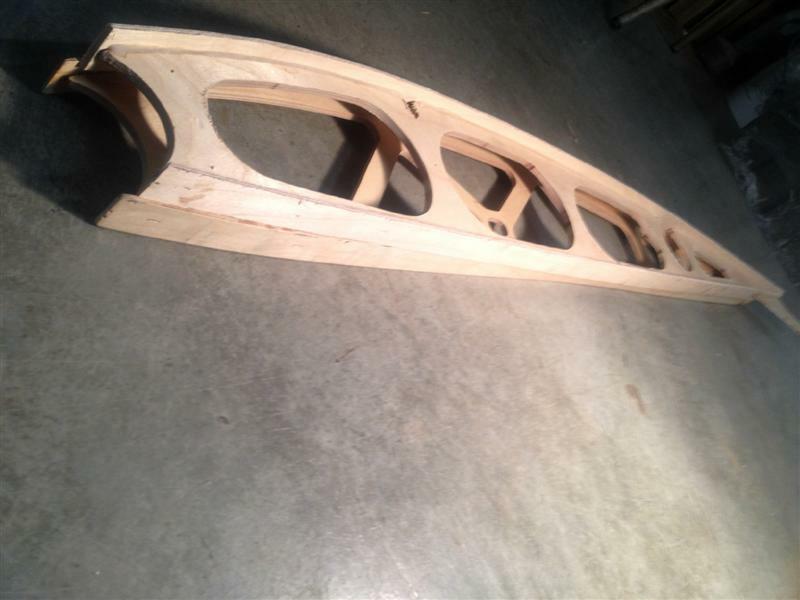 diameter, airfoil, rib spacing and drag tubes. due to their wider rib spacing. Speedwing: .065" thick 2-1/2" o.d. spars; 108-1/2" spar length; 3/4"
Mk-IV HH: .083" thick 2-1/2" o.d. spars; 144" spar length; 7/8" dia. lift struts; Avid undercamber airfoil; (13) ribs ~ 12" o.c. ; (1) 1/2"
Short 5/16" dia. alum root rib brace tubes; (1) W-4 Short 1/2" dia. 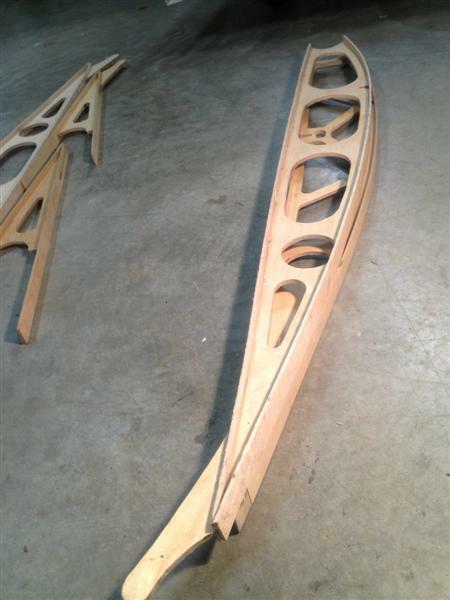 struts; Avid undercamber airfoil; (9) ribs ~ 18" o.c. ; (4) 1/2" dia. rib dimensions (long rib flaperon hinge) are 35-1/2", 71", 106-1/2"
even cut a tube to verify wall thickness. #10524 offer more details. Search function is your friend. Well, no matter what the snowmachine engine sounds like, we all have lots of common ground and help each other a lot. I have the STOL wing on my Bandit with 9 ribs and 2 nose ribs between the wing ribs. It also has 7/8" lift struts with .083 wing spars. What do you need to know about the plastic LE kit? I had them on mine, per Kitfox instructions, Made templates of plywood with copy of Kitfox drawing glued to them, then used that to line up lE, tape it in place, then glue with 9460. Removed them when I decided to extend LE per Harry Riblett instructions for CG with Soob engine that Doug posted. I have extra templates, and will mail you one if you need it. I also have salvaged plastic LE if anyone wants to buy it. Ed, did you fly the airplane with and without them. Is it suppose to help speed or stol performance. I was wanting to check and make sure they are installed correctly. I called kitfox and he said it was not designed for the avid only the kitfox so he would not tell me anything about it. How is the progress coming on the ribblet desing? If you could send me a template that would be great. Let me know if you want something for it or shipping. Supposed to help cruise speed - dont know how much - cleans up LE too - LE extensions coming slow dut to torn rotary cuff and hot weather - see my photos on LE extensions. Will put template and some instructions in big envelope and mail tomorrow or next day. The PVC leading edge extrusion was never designed to be added to the under cambered airfoils used on the KF I-III or Avid HH/STOL wings. I have heard two stories regarding it's design... First is that Kitfox decided to add the extrusion after the model 4 rib re-design to a.) sharpen or reduce the leading edge area in an attempt to increase speed, and b.) help move the center of gravity forward slightly for the heavier engines. Second is that the extrusion was actually an integral part of the Riblett designed laminar flow airfoil from the git go (which seems to be supported in the Riblett research notes I've seen). I suspect the truth probably lies with a combination of all of the above. In any event, many builders did add the extrusion to KF I-III and Avid HH/STOL wings once it became available. I have only read a couple of posts from either camp extolling a slightly lower stall or landing speed after install, but no appreciable increase in cruise speed. 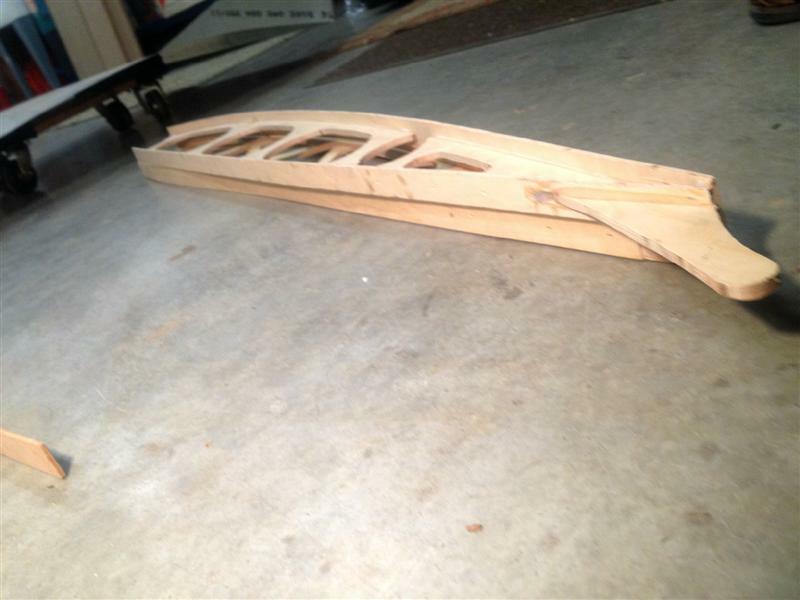 Several Avid owners who added the extrusion to their HH/STOL airfoils also reported little more than added build time, expense and weight for the effort. In fact, there was another, similar leading edge extension actually designed for the Avid STOL wing (that added ~1-1/2" ahead of the spar using aluminum sheet) that never took hold, presumably because of negligible gains. Seems the original design of both (KF & Avid) under cambered airfoils is hard to improve upon. I would add, just in case you're under the impression that the KF I-III and Avid HH rib profile are exactly the same, they are not. I've put comparison pics on this site somewhere. To my knowledge no dangerous flight characteristics were ever reported when fitted to the under camber wings so I see no reason not to use 'em if if you like 'em. Setting aside any performance arguments, the KF extrusion does have aesthetic appeal on all models IMHO. It nicely covers the lift strut bracket and rivets that otherwise shows through the fabric. FWIW, the original builder of my KF III did not use the extrusion and I opted not to add any extension or extrusion when building my Avid Mk-IV HH wings. However, I did decide to use the KF leading edge extrusion when building my custom Avid+ wings based on Avid's flat-bottom speed rib (a very, very similar profile to the KF 4-7 Riblett laminar flow airfoil). Since the Kitfox extrusion was not designed for the under camber airfoils, there can never be a 'correct' position on those wings. 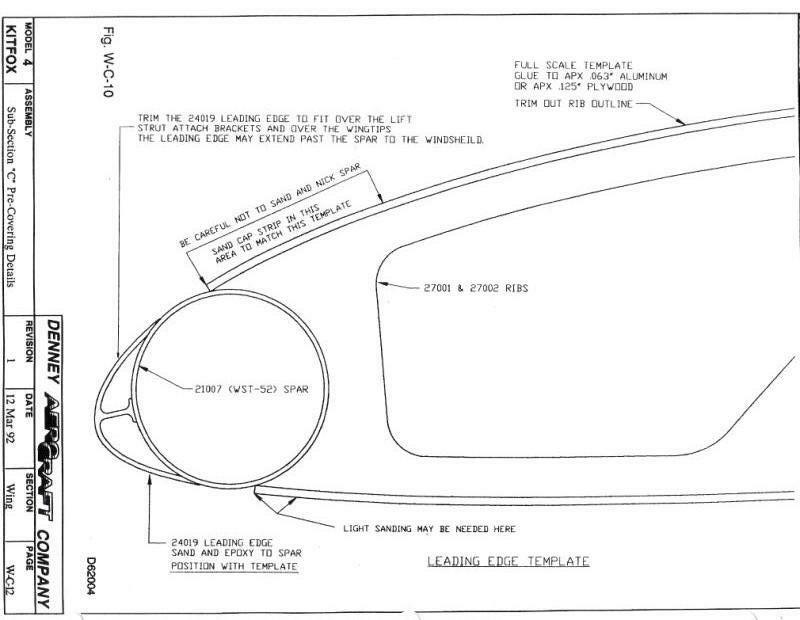 If I were to install them on an Avid HH wing, I would try to follow the top rib profile in the KF template (copy attached) as much as possible. Upon further researching this plane it is actually the Airdale. I was getting confused looking at all the pics on here of the avid+'s and seeing the gear attach are and push pull cables for the flaperons being diff. Well hopefully that is a good sign as it has alot more leg room to the rudder pedals as my model C does. I pulled some measurements and found it is onlt 1" wider at the shoulder are and 4" wider at the instrument panel than my model C. But the bubble doors seem to be wider than the C and these doors have opening windows, a big plus. What do you guys think of the washout in the wings, mine appear to have quite a lot of twist. I am more going for speed for this bird as opposed to super stol capabilities, western MN is pretty flat. How much faster is the speed wing vs stol wing, anybody have any speeds to compare. I do have the speed wing and the LE kit appears to be mounted lower on my wing than in the pic you put on here. I dont think that will matter much as I will be tearing the wing down for recover and change it then. The LE kit was an after thought as it is glued on top of the original fabric. It appears as he glued it on with poly tac not hysol so it should be somewhat easy to remove. The wings do NOT have the steel drag tubes or plywood gussets in either and from what I have read on here than should be done for the 1400lb gross. Yep, I was pretty sure that was either an Airdale Flyer or one of John's Avid Mk-V (Pursang) prototypes when I saw the BS ad. I am interested in seeing lotsa pics when you get tha chance, particularly of the teleflex routing to the flaperons. Not too late to change my Avid+. In any event, you are the first onsite with an Airdale Flyer and I think Leni should add a new forum for you so we can follow along with your new toy. As to the wings, sorry, yes I see you have speed wings. First re: washout. 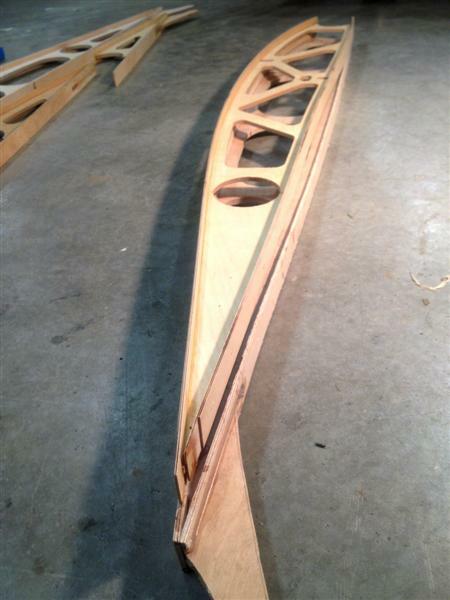 IIRC, the Avid manuals called for 1-1/2" twist when building speed wings with the 108-1/2" long spars. If your wings started out as Aerobat wings with 0.83" short spars then had the extension kit added, the resulting twist to the new tip is excessive and will create a speed penalty. Short of reducing the washout or removing the extensions, not sure what you can do about that. I built my speed wings with 144" long spars and 1-1/2" twist, but really wish I used 1-1/4" or even 1" (my KF 4-1200 with similar flat bottom rib uses only 1/2" twist). Second re: higher gross. To get the M.T.O.W. of the Airdale Flyer to 1400lb gross, your wings will need more than the steel drag tubes and gussets. Airdale also used 3' extruded aluminum 'I-beam' spar stiffeners riveted along their entire length within each 0.83" spar and heavier wall lift struts and rod ends (can't recall exact spec but probably have them in my notes somewhere). Also, I seem to recall hearing that the Airdale Flyer incorporated a small amount of forward wing sweep, as it was designed around the heavier Soob FWF. I think most HH and STOL wing Avids then to hit an aerodynamic wall (or a point where fuel usage becomes stupid) at 80-100mph depending on empty weight and engine. I'm guessing your Soob powered Airdale Flyer with Avid Flyer speed wings will be comfortable cruising at 100mph and top out at 120mph+, if indeed you do have excessive wing twist. I bet you could add 10mph to those figures using factory built Airdale Flyer 1400lb gross speed wings. That is what I am shooting for my 912ul Avid+ w/ custom 1320lb gross long speed wings. 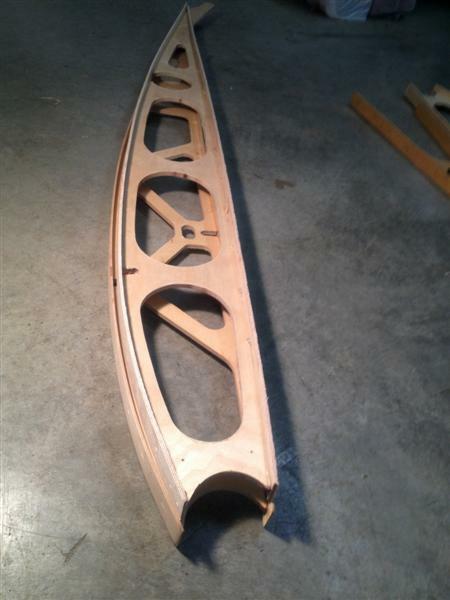 When you get the template I sent to you (probably Saturday) note that it is the profile for the Kitfox 4 rib, and you can see that there isnt a nickels-worth of difference between that and the earlier KF stol ribs in the LE position. The big differencer is aft of the template on the undercamber. You can compare it to your ribs and make your own decision about adding it. IMO, I would add it. I will get some pics in the next few days, I think I will start a new thread for it so I can keep people updated on it. If there is any certain thing you want a pic of just ask. I forgot about the stiffner in the spar until you reminded me about that and it does have the 1" wing struts and the heavy adjustable rod end. The rod end must be 3/4" od on the threads, I think they call it the magnum rod end. Will get pics of that also. will take a look at it when I get it. If I stay with these wings I will install it the right way according to your template. I looked at taking the twist out of the wing but it has the aluminum on the top of the wing over a foot back from the leading edge and it is hysoled to every rib, so I dont think it is feasable to try and rework these wings. I am just thinking that with that much twist it will slow me down alot. The other option I have is sell these and build a set that I want. Any takers for a set of wings??? I have been calling Brett at airdale but no answer or call back yet on the price of a wing kit. Any suggestions as to what to do with the wings, maybe get a kitfox 7 wing kit for it or a eurofox wing would be nice. Dont know what Kitfox is using for spars now - on the KF5 it was still .065 wall - Thought only Avid had .083 ? 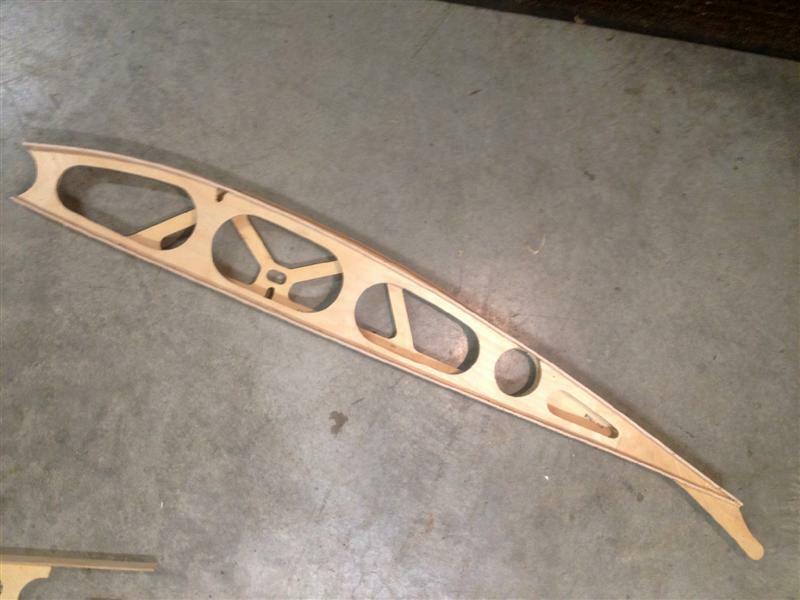 Of course, you can buy your own .083 and start scratch-building wings - takes longer tho. Interesting about Magnum rod ends, when they still use a 1/4 inch attach bolt........There was a plane that flew with only about 6 feet of wingspan - forget name of it - flew fast too. ......There was a plane that flew with only about 6 feet of wingspan - forget name of it - flew fast too. Here you go Ed. I've seen R.C's bigger than these. If your wings were built with the short spars and extensions added, based on everything else you said, I would probably just add the steel drag tubes (if it doesn't already have them) and gussets, recover and go fly. You have too many hurdles to overcome (not the least of which are the spar stiffeners) with these wings to honestly get to 1400lb IMHO. Do check the twist to see if it was built to the book. Many short wings were built with less than full twist, particularly if wing extensions were being contemplated as a later mod, and you might just get lucky to find it is not as bad as you think. To get the MTOW to the full Airdale Flyer spec, I would build or buy new/used wings. If I bought or built wings, it would be a set of 1550lb KF 5-7 wings. They are 0.65" spars but with proper spar stiffeners strong enough to meet your 1400lbs and I feel that airfoil is definitely superior to the Avid speed rib. The 27-1/2" f/r spar pin bushing distance is the same on both planes but the wing angle of incidence will change slightly due to the different location of the rear spar hole position in the rib web. I suspect your horizontal stab has an adjustment bolt to compensate but you would need to buy new KF flaperons. You might have to adjust the KF flaperon control horn position on the flaperon control torque tube end where connected to the mixer push/pull, but I suspect control rigging would prove fairly easy with the teleflex cable setup you have. 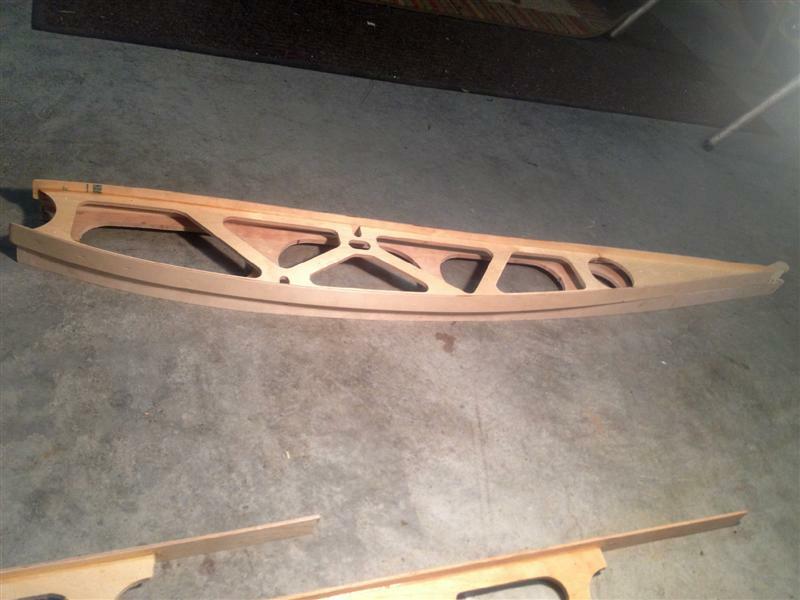 I've attached a comparison pic of the KF 4-7 rib (truss style web) vs. Avid speed rib (oval cutouts). You can see the slight undercamber on the KF 4-7 rib that results in a higher lift wing with little (if any) top speed penalty. QUESTION: What GW were the original Airdale wings? 1320 or 1230 or ? MARK - ARE YOU SURE that you did not buy the orginal PURSANG? Did John show the Pursang to you? I got the leading edge cutout from you on sat. Thanks again for it. I dont know what the GW of the airdale wing is or what wing it is but from what I have seen it is supposed to be 1400lbs. I have been calling Bret at Airdale for a week and still no call back from him so I will be calling kitfox on monday to see what comes with the wing kit from them. Thanks for the pics of the ribs. The wing has about 2.5" of twist as far as I can tell.It seems like alot to me. The inboard edge of the wing is flat on a saw horse and I took a pic of the outboard end. Take a look and see what you think.